It is still unclear what impact the crisis in Tibet will have on the prospect of talks between the Dalai Lama and China's leaders. What is clear, though, is that the options are changing. 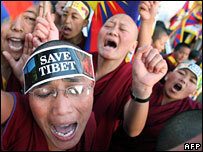 Many Tibetans are deeply frustrated. After decades of waiting, they see little sign of progress. Ten Zin Samphel is a leader in the Tibetan Community in the UK who was born in India. Speaking just for himself, he told the BBC he saw the goal as "complete independence". Some say that is not practical - that an independent Tibet would not be viable. It might struggle to cope economically. Ten Zin Samphel dismissed that. "At the moment, the economic development is for the benefit of the Chinese," he said. "If Tibet were free, we could develop it ourselves." An independent Tibet might also be vulnerable. It would sit between two regional and rising giants, China and India, with a disputed border. Prof Robbie Barnett, a Tibetan specialist at New York's Columbia University, said there would be challenges, but not insurmountable ones. "Political solutions are made to work because of the intelligence and political will of those involved," he told the BBC. "Independence would be enormously difficult as a project. But it would depend on how it was designed and managed. That would be up to the participants to decide." Even if the demand for independence is growing among Tibetans in exile, politically it seems a distant hope. 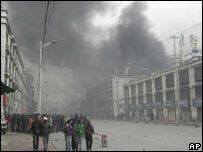 The very idea puts Tibetans in direct conflict with Beijing. It is extremely unlikely China would agree to any negotiations unless, as a pre-condition, independence was ruled out. China does not want to set a precedent that could influence other ethnic minorities. The Dalai Lama calls not for independence, but for greater autonomy within China. There are various formal frameworks through which that could be achieved. A "one-country, two-systems model" is one possibility. So far, that model has gone well in Hong Kong - although Hong Kong and Tibet are at very different stages of development. Prof Barnett described the Hong Kong model as "very promising". He suggested another possible compromise too - the sort of self-rule formula agreed for Tibet from 1951 to 1959. That gave Tibet much greater control over its own affairs than it has today. It also included the presence and leadership of the Dalai Lama. If a formal framework for expanded autonomy is unacceptable to Beijing, it could introduce interim confidence-building measures. When they revised their plans for Tibet in the aftermath of the late-1980s protests, China's leaders thought a programme of rapid economic development in Tibet would stifle calls for political change. But although they have poured billions into the region and increased the standard of living of many Tibetans, the sense of anger has not been defused. Some say that is because the measures were ill conceived. They benefited Han Chinese settlers more than Tibetans and focused on urban business development, rather than rural and social programmes. Now they could be adjusted. Prof Barnett suggested a range of measures to protect Tibetan culture, which would not force China to relinquish political control. "Policies could focus on limiting long-term migration, focusing on high-end tourism rather than mass tourism, on Tibet-centred development rather than GDP growth," he said. "[They could also focus] on affirmative-action policies in all businesses and institutions, on true bilingualism for all levels of schooling, so Tibetan could be a medium of instruction." An end of religious restrictions on monks, nuns, students and government employees would ease tensions considerably. "Those measures wouldn't threaten any kind of political control at all," he said. Kate Saunders of the International Campaign for Tibet agreed. "If there were curbs on migration, an awareness of how the ethnic composition of some areas is changing dramatically, that would be a step forward," she told the BBC. Investment in health and education, rather than in hard infrastructure like roads and railways, would also boost confidence, she added. At the moment, the high illiteracy rates in Tibet are a barrier for local people as they try to compete with Han Chinese migrants. "Ultimately, the only way forward is for a 'Tibetanisation' of development - to incorporate Tibetans into decision-making on their own economy," Ms Saunders said.